It's here! The 40-year retrospective of Yves Saint Laurent is now happily and beautifully displayed at the M.H. de Young museum in San Francisco's Golden Gate Park. I have been looking forward to today's press preview for months, and the whole morning was well worth waiting for! I learned a few days ago that not only would the international curators of this exhibit be attending, but also some of Saint Laurent's best couture clients, close friend Betty Catroux, and one-time love and long-time business partner, Pierre Bergé. This was going to be quite the preview - as it should be! The Fine Arts Museums of San Francisco and the Montreal Museum of Fine Arts collaborated with the Fondation Pierre Bergé-Yves Saint-Laurent to create this comprehensive gathering of Saint Laurent's most iconic fashion ensembles, direct from the company archives. Of course, the passing of Monsieur Saint Laurent earlier this year puts all of this into much higher relief, making the show not merely a simple a retrospective, but a celebration of the life and vision of this singular designer. Speaking so softly as to barely be heard above the snapping cameras, Monsieur Bergé opened his remarks by saying he wanted "to talk about Yves." It is clear that his own sadness at the passing of his friend and companion is still very close to the surface, with this gathering being especially poignant for him. 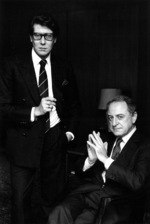 Bergé and Saint-Laurent met in 1958 and opened the Maison Yves Saint-Laurent in 1961, with Bergé managing the business and operations end of the company. While the pair's personal relationship has sometimes been called "rocky", Bergé and Saint-Laurent remained in close for fifty years, with their mutual fondness and solidarity remaining steadfast. Bergé said "Is fashion art? I don't know. I doubt [it]. What I know is to create fashion, you must be an artist." The exhibition is arranged within four themes that truly celebrate Saint-Laurent the artist: Masterful Pencil Strokes, The YSL Revolution, The Palette, and Lyrical Sources. The arrangements show the different facets of his design and its far-reaching influences. Ensembles are grouped by similarity, not in chronological order. This allows the visitor to see how Saint-Laurent returned to the same inspirations throughout his forty years of design. The different themes could be called out to the viewer more clearly in the exhibition space, but the essences of color, shape, texture, and art are easily seen. When I spoke with Jill D'Alessandro, associate curator of textiles at the Fine Arts Museums of San Francisco, she said that her "favorite" part was difficult to define, but that she was most fascinated by the contrasts and dichotomies he always explored. "Masculine/feminine, black/white, or how he took a painting - something flat and static - and put it onto something that moved." 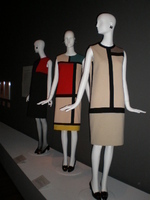 Certainly the three Mondrian dresses that are shown look as fresh and fabulous as the first time they appeared on the cover of Paris Vogue in 1965. In a measure of true classics, truly timeless haute couture, there were many pieces that were many decades old but would still be very chic today. 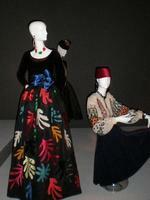 I spoke with Diane Charbonneau, exhibition co-curator and curator of contemporary decorative arts at the Montreal Museum of Fine Arts, while standing in front of two gorgeous evening gowns that were designed in tribute to Henri Matisse. We both agreed that while the ensembles were at least 25 years old, both of us could wear them this evening and be the chicest women in town. It was this visionary design that made Saint Laurent a master, and all of this is on display from the cheetah prints to the stacks of bangles - the trends are still with us today. Diane Charbonneau and I also agreed that the next greatest thing to see in person is the incredible craftsmanship. The opulent textiles and embellishments such as Lesage embroidery are a feast for the eyes. If anything, the exhibition could be seen as a celebration of fading handcrafts and subindustries of the world of haute couture. Houses like Lesage have been creating embroidery with thread, beads, riboons and sequins since the Belle Epoque, but are now among a dying breed of artisans that serve a clientele that is getting more and more rare. 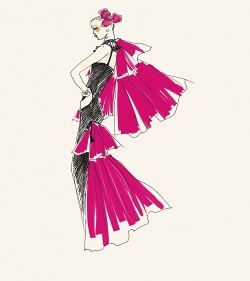 It is on the clothing of Yves Saint-Laurent that one can see this craft up close: an evening gown with appliques of Schiaparelli-inspired lips shows that no two sets of lips are identical - they are each shaped differently, with individual silhouettes and materials. It is this type of detail and collaboration between designer and craftsman that brings the greatness to this oeuvre. As we visited the final group of literary ensembles, (a velvet tuxedo in tribute to Oscar Wilde would look perfect on Blair Waldorf if she were trying to dress like Chuck Bass...) I was introduced to Monsieur Bergé. I began by saying "Bonjour Monsieur!" and then quickly became tongue-tied as I realized that I should probably NOT embarrass myself by trying to speak French in that moment. So, I got nervous and sputtered something about enjoying his stay in San Francisco. I had always heard that he was ruthless in business and more than intimidating to his underlings - so who was this cute smiling man in front of me? He was warm, kind, and when he squeezed my wrist in farewell the gesture was unexpected, gentlemanly, and affectionate. I was completely flummoxed. It's not every day that I meet a living legend, and certainly not every day that they're actually nice about your being nervous around them. Fans of Saint-Laurent can be fanatical, talking of the designer with a bit of a frenzied adoration and almost proprietary love. Once a devotee, always a devotee. My mother has always loved Yves Saint Laurent, which is why, as I've mentioned before, this was the first designer I ever knew. She still talks with fondness of her trousers, skirt and sweater purchased at the Boutique in Dallas years ago, and how she wished she'd had that odd $300 then to buy the peacoat too. I felt it was only appropriate then that I bring my Mom with me to this preview. Her favorite ensembles were from the 1976 Ballet Russes collection; when approaching a full-skirted mannequin with a fur vest and hat she said: "THIS was the one I always wanted..." This is definitely a show to feed everyone's closet dreams. In a final note of cleverness: I loved that the museum put the entire press kit onto individual memory sticks, packaged into cute boxes with pink labels. They looked like slices of cake on a tray - delightful and smart. I also loved that we were each given the museum's own edition of the "Yves Saint Laurent Couture Coloring Book" - a very fun party favor for kids young and old. A very special thank-you to Jill Lynch at the Fine Arts Museums of San Francisco, and a huge congratulations to everyone involved in bringing this very special exhibit to our beautiful new museum - the exclusive venue for this exhibit in the United States. Do not miss this show - you will regret it! 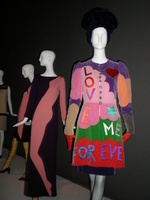 Please visit my Flickr feed for even more images from the Yves Saint Laurent exhibition. For my other posts on Yves Saint Laurent, please visit Master Class from June 2007, and Going Gauche from October 2006.